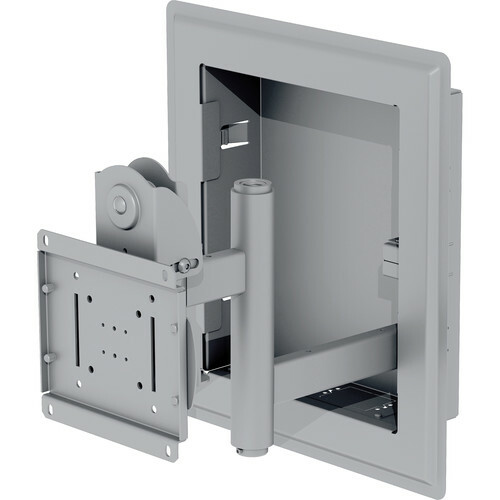 The Peerless IM760P-S In Wall Mount will maximize your flat panel experience by installing truly flat against the wall with its in-wall mounting solution for 32 to 71" screens. Installation is quick and easy thanks to the mount's self-locating tabs that center the in-wall box snugly between standard 16" wood stud centers. View the flat panel screen in its no-profile home position, or extend the arm over 19" to watch it virtually anywhere else within the room. Note: Check manufacturer's web site (www.peerlessmounts.com) to confirm adapter plate compatibility. Box Dimensions (LxWxH) 24.938 x 22.75 x 6.625"